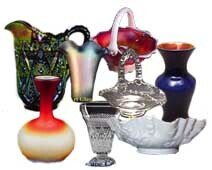 The museum contains displays of Imperial Glassware, as well as other Bellaire glassware, from the Ohio Valley Glass and Artifacts Museum. The museum is dedicated to the glassware and people who worked at Imperial. The National Imperial Glass (NIG) Collectors Society hopes that by creating the museum they can keep alive the story of Imperial. Imperial was one of the largest and most diverse of the companies that made up the American handmade glass industry.